Southern Nautilus, begun in 2007, will be a series of 8 individual works. The first 4 Southern Nautilus were exhibited at; Pataka Gallery Porirua, Pacific Artists; The Goodman Suter Gallery, Nelson, The Maui Dynasty; at Kaohsiung Museum, Taiwan, The Great Journey, and at The October Gallery in Bloomsbury, London, Contemporary Oceanic Artists. The form is inspired by the shell cradles that protect the eggs of the female Paper Nautilus. The initial layer of spiraling text is sea-sounds. I assemble lists of words about the ocean, references to coastal places that have influenced my life and to the childhood memory of listening to the sea, holding a shell to one's ear. There are other references - to navigation, to endangered fish species and to the plunder of the ocean by over-fishing and deep sea trawling. I have used new and traditional technology to create this series of spiralling shell sculptures. 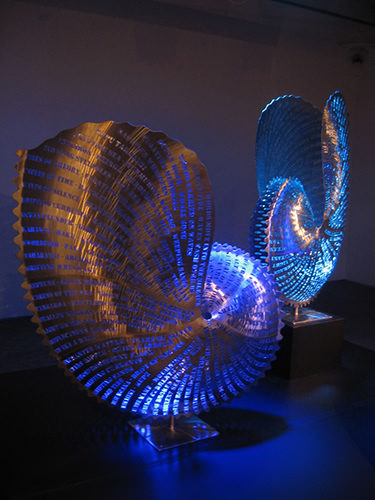 To ensure that each Southern Nautilus is unique, the text and forming of the stainless steel in each work varies. Dimensions: Height 1400mm x Width 750mm x Depth 850mm. Materials: 2.5mm Marine Grade 316 Stainless Steel, hand finished.